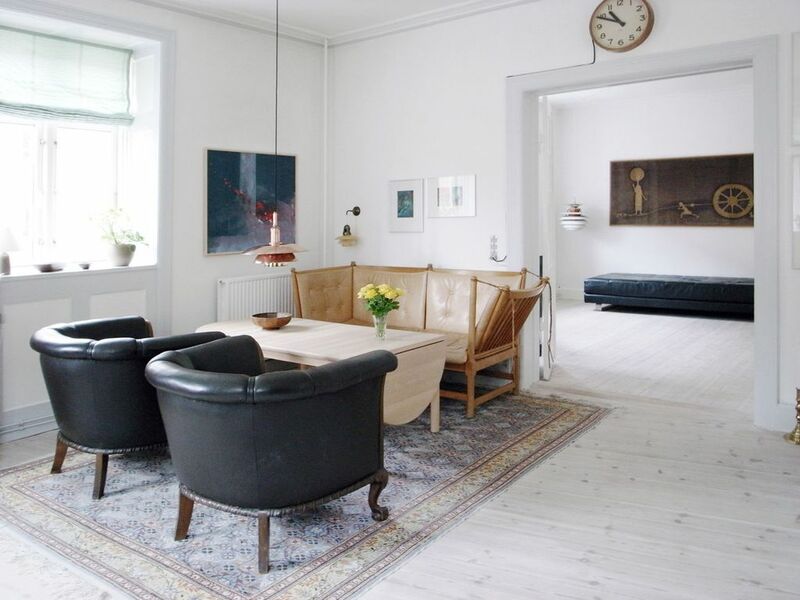 This apartment is spacious and tastefully decorated, located in the calm neighborhood of Østerbro. The bright and modern family room is a beautiful compliment to the 2-bedroom flat, and in the courtyard you can relax and enjoy the fresh air with a blanket on the lawn. This is a very large and brightly lit apartment with its 116 m2. Located in a corner building in the Østerbro-neighborhood, you really get to experience the tranquil part of Copenhagen, yet still being close to the city center. The flat is perfect for the sole traveller looking for a stylish place to stay, or for the group searching for an unpretentious atmosphere to enjoy good dinners and homely company. In the courtyard you can enjoy the evening sun, where you will find a playground, garden furniture and a lawn, which you are welcome to use. The apartment contains a spacious corridor, two bedrooms and a modern kitchen and family room, as well as a bathroom and toilet. A Cable TV-package, WiFi, Stereo and a DVD-player accompany the apartment. We liked how well the apaartment was equiped. The kitchen was logically laid out unlike some properties. The range of music was good and overall cleanliness good. We found the bedroom with the double bed too low and not enough room the make up the bed but other than that this was a lovley apartment which we would easily reccommend. The area offered excellent and easy access for shopping and travel. Lovely apartment, beautiful decor, well-equipped kitchen, close to bus routes for visiting the center of Copenhagen. Shops close by. Nice apartment, very roomy and light. Could do with better bedding but otherwise very comfortable. We really enjoyed our stay at Østerbro and the appartment in particular. Lots of design furniture and a well equipped kitchen. The backyard was really good for kids with toys and playground. Short taxi trip (or bus) down town and a local beach nearby which provided all opportunities we looked for. The beach was not that delicate due to garbage in the shallow waters, but that might have been a weak moment only. Would definitely recommend the area, appartment and service (really easy and convenient). Excellent apartment with everything we needed. Clean & well maintained. Quiet location away from the centre of Copenhagen, but easy transport links and local shops, bars, coffee shops were good. Would highly recommend.